TIG stands for Tungsten Inert Gas. Unlike MIG or ARC welding, TIG uses an electrode separate from the filler material. This electrode is called the tungsten, and different varieties of them have different welding characteristics. The inert gas is typically Argon, or sometimes Helium or a mixture. Why should I TIG weld? TIG welding works on a wider variety of metals than any other type of welding. It also produces some of the cleanest, strongest welds possible. TIG usually produces no sparks, no spatter, no slag, no smoke and no fumes; if it does you didn’t clean the project enough before, or you are welding a low quality metal. Also it’s easier to TIG overhead or in cramped quarters without being showered with sparks and slag. Argon can be used for nearly all TIG welding. Helium is sometimes used when greater penetration is required, or for higher speed welding with a hotter arc. What are the different colors/types of Tungsten and why would I use them? Green is the identifying color given to pure tungsten electrodes; it has the lowest melting point. All of the other colors have higher melting points, better arc starting or maintaining characteristics, lower chance of weld contamination and/or longer life, but they are also more expensive due to the rare nature of the other elements added to them in small amounts. Red (Thoriated) features easy arc starts, great durability, good balling for arc stability, low risk of weld contamination and high current carrying ability at lower amperages, but it is slightly radioactive. Gray/Orange (Ceriated) are great at starting arcs, and welding at lower amperages, with DC or AC, but at higher amperage settings they begin to break down (recent changes has the former orange coded electrodes now IDed with a gray band). Gold (Lanthanated) are durable and stable, with good arc starting properties and are suitable for AC and DC welding with higher current carrying abilities for a given diameter. Brown (Zinconiated) provide an arc that is extremely stable, because of this they are great for welding with almost no contamination, but are never used for DC welding. When do I use AC and when do I use DC? Typically steel, stainless and iron alloys are welded with DC and a negative polarity. Aluminum and magnesium is welded with AC, and sometimes with a square wave AC current. Why am I consuming my Tungsten so quickly? – The tungsten is a consumable, but if you are using it too quickly check these things: Inadequate gas flow, Welder set to electrode positive, Improper diameter tungsten for current, Overheating tungsten, Gas not shielding after the arc, or Using the wrong gas. Why is tungsten contaminating my welds? Generally this could be one of two things. Either the tungsten is melting into the weld puddle, because you’re using too small of a diameter electrode. Lastly, and the most common, you may be simply holding the torch too close and you dipped the electrode into the puddle, which also contaminates the tungsten. Why do I have yellow powder or smoke on my tungsten? Typically this is caused by not enough shielding gas, and the tungsten reacting to the environment. Check the flow rate (15-20cfh), make sure the gas bottle isn’t getting low, make sure the post arc flow is adequate and make sure you are using the correct shielding gas. Can I TIG weld on 110v? Yes, of course you will be able to weld at higher currents with 220v, but 110v is fine for smaller jobs. The Eastwood TIG 200 AC/DC machines come with both 110v and 220v plugs. Do these machines have everything you need to get started, other than the tank and Argon? Yes, you will need to get a tank full of argon, but otherwise everything is included. They even come with a tungsten electrode to get you started. What is scratch start, lift-arc and high frequency start? Scratch start is much like it sounds – in order to strike an arc you would scratch the surface with the hot electrode completing the circuit. This could contaminate both the weld and the electrode. Modern inverter based machines use high frequency alternating current just at the start to overcome the resistance and make the electricity jump the gap between the torch and the work surface. Lift-arc is a method used when HF will interfere with electronic equipment, like CNC machines. An electrically cold electrode is touched to the surface, and current flow the second it is lifted, which greatly lessens the chance of contamination. What is square wave AC? In the old days AC current through a transformer TIG welder alternated in a standard up and down smooth wave pattern. This meant the current was either rising or falling all the time, and most of the time was not actually at the setting on the dial. Since the 70s inverter machines have had the ability to switch from positive to negative polarity instantly, with almost no transitional period between them. This is great for arc stability, as well as giving you full power all the time. Do I need an AC/DC unit, or just DC? This really depends on what type of welding you see yourself doing in the future. If you plan to only do mild and stainless steel a DC TIG welder will be sufficient, but if you see yourself doing Aluminum ever in the future it is best to upgrade to a machine that will do both AC and DC. The cost difference often times is minimal and it really comes in handy those odd times where you may need to do AC welding. What do I need to TIG weld stainless steel? TIG welding stainless steel is pretty similar to welding mild steel, but it does require a stainless filler rod that closely matches the base metal you’re welding with. Most commonly you will be welding 304 stainless, so a 308L filler rod will suffice. Be sure to upgrade your filler rod to match if you’re welding a higher grade of stainless. The best rule of thumb is to always be using a higher grade of filler rod than that of which you’re welding. TIG welding stainless may require “back purging” and a higher flow rate to keep the correct temperature, gas coverage, and “coloring” of the weld. This all varies on the job and takes some practice and testing to find what works best for you. What are the proper settings for welding stainless? The settings on your welder will be similar to that of mild steel, as with any TIG welding final settings will be dependent on your personal preference. Many prefer to turn the shielding gas flow up a 5-10 CFH for welding stainless to get optimal coverage. Using a gas lens kit on your torch will also help and require less gas flow since they gas coverage is better with a lens kit. What do I need to TIG weld aluminum? Welding any type of metal with a TIG welder requires a nearly surgically clean weld joint, but with aluminum it’s even more important than with mild steel. Make sure you first sand or wire brush the protective coating or light corrosion off of the surface until it has a dull silver finish. Once any coatings or corrosion have been removed wipe the entire piece, especially the weld joint with a non-chlorinated degreaser or cleaner to wipe any grease, or residue off of the panel. Believe it or not even your greasy fingerprints can cause impurities in an aluminum weld joint! Otherwise you just need to match your filler rod as closely as possible with the grade of aluminum you’re welding. A 4043 rod is a good all around aluminum filler for most jobs. What are the proper settings for welding aluminum? Like welding any type of material, this is subject to the thickness metal, what type of joint it is, the machine you’re using, etc. On the TIG 200 the clearance effect is going to be a variable that you will use that’s not in use on when welding on the DC side. Adjusting the clearance effect either way will give you either more penetration or more cleaning effect. This setting will vary on how clean the metal is and what type of aluminum you’re welding. For instance, an older cast aluminum part like an intake manifold may be made of a lower grade aluminum that is dirty by nature and requires more cleaning to get a nice clean weld than with a fresh sheet of 4043. A good clearance effect setting to start with is -2 to -3. From there you can dial your settings in from there. As always test on a scrap piece of similar metal or in a discreet area of the part to get the machine set correctly. Can cast iron be TIG welded? How? Cast Iron can certainly be TIG welded. The preparation process is a little different in which you need to pre-heat the part and weld it while it’s hot. This requires putting the part in a shop oven (don’t use the one in your kitchen!) or preheating the weld area just before its cherry red with a torch. Otherwise the welding process is basically the same as any other material. How do I properly prepare the tungsten tip? The tungsten electrode tip needs to be ground to a similar shape as a lead pencil. This can be done a number of different ways but the simplest are by using a belt sander or bench grinder. If possible dedicate an entire grinder/sander or at least a single wheel or spot on your sander for ONLY grinding tungstens. Using the grinder you use to clean off rusty or greasy bolts will inject the contamination into the tungsten and cause ghost-like contaminations in your welds. Hold the electrode so that you’re grinding it WITH the way the wheel is spinning on the grinder or sander. If you sand across the grains you will have an unstable arc that will wander all over the metal. To get a consistently shaped pencil sharp shape on your electrode chuck your electrode up in an electric drill and spin it as you sharpen it on the grinder/sander. How do I fix a contaminated tungsten tip? When learning to TIG weld you WILL get really good at grinding tungsten electrodes. This is because you will spend a lot of time dipping your electrode in the weld puddle by accident. As SOON as this happens you really need to stop and regrind the electrode. A contaminated electrode will have small specks on it, a ball on the end where it was dipped in the puddle, or even could be melted back. A tip to save time is to grind both sides of your electrode so you can save a trip to the grinder by just flipping the electrode when you contaminate one side. What should my shielding gas flow rate be set at? Shielding gas coverage is very important on TIG welding and you need to make sure you have the correct settings on your bottle so you have clean welds AND so you don’t blow through a bottle of Argon in a few hours! A good baseline to start your settings at is 15-20 CFH and you can adjust up from there if needed. What is pre/post gas flow? Pre-Flow is the gas that exits the torch a few fractions of a second before your machine initiates an arc. This blows out any impurities in the torch and also assures the weld joint is protected as soon as you start melting metal. A good practice is to always purge the torch by tapping the pedal once before your first weld of the day to blow any impurities out of the torch. Post-flow is used to protect the weld immediately after you have stopped welding when the weld is still molten and soft. The post-flow time needs to be raised when welding aluminum as it is more vulnerable for a longer period of time after you stop welding. Too little post-flow will cause the end of your puddle to develop very small cracks in the surface that can grow over time (not good!). 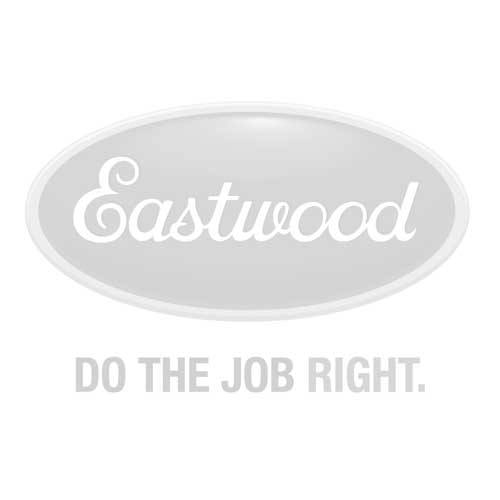 I would like Eastwood to tutor on welding Moly Chrome tubing or tube chassis repair. Tengo un pequeño taller de soldadura y necesito una maquina para soldar aluminio, el trabajo es mucho y constante aguantara el ritmo de trabajo la soldadora tig 200 ac dc?, si es asi cuanto me cuesta el envio a Guadalajara en Mexico, gracias por su atencion. I like to learn about TIG WELDING.